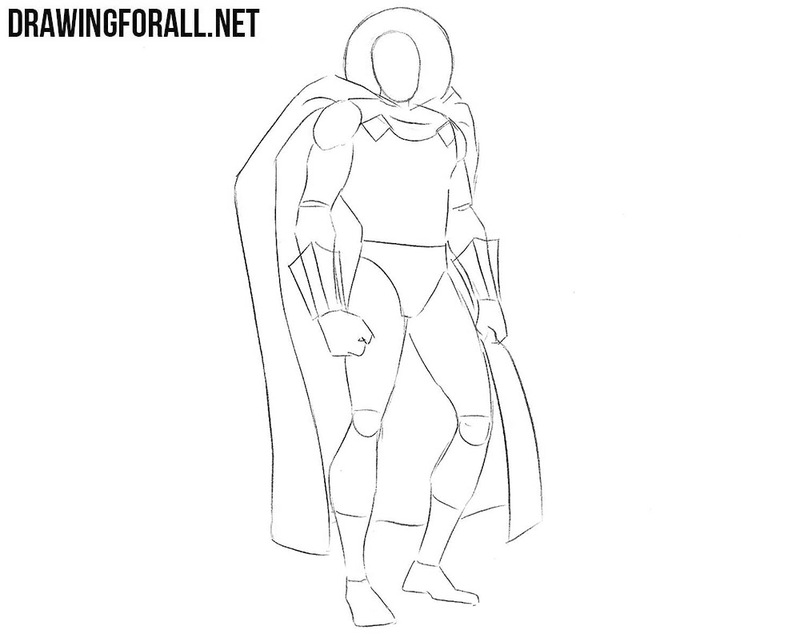 Today we will tell you how to draw Mysterio from Marvel Comics. As you probably know, Mysterio is one of the most famous old-school enemies of Spider-Man. At this drawing Mysterio stands practically straight, and it will be pretty easy to draw his figure. Take a pencil and with the help of light lines sketch out the head in the form of an inverted egg (or an oval). After that, draw a line of the spine on which the thorax and pelvis are located. At the end of the step we sketch out the arms and legs. First draw the neck in the form of a very short cylinder. Then, sketch out a body that narrows in the waist area. 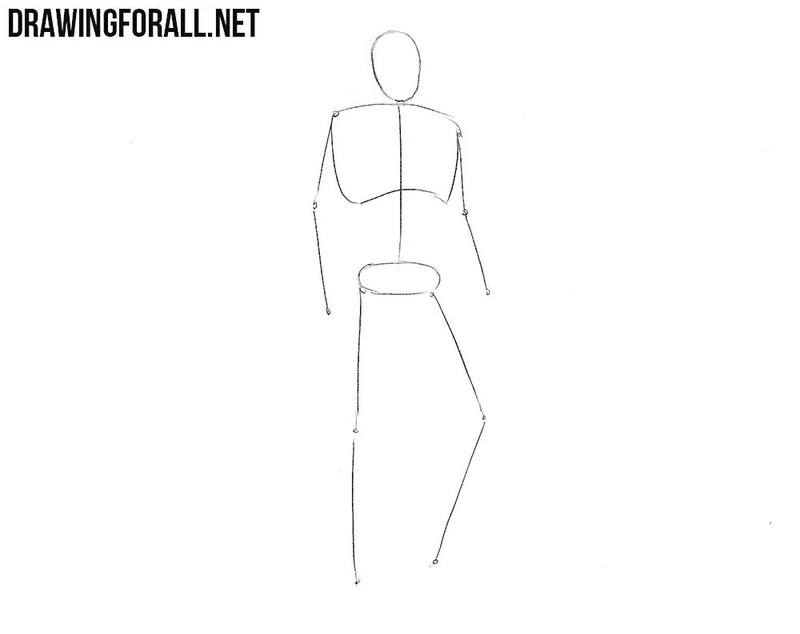 Sketch out the shoulders in the form of circles and arms using shapes of cylinders. In the same way we draw the legs and move to the next step. In different comics, Mysterio has a different appearance. However, he always has a mantle and a crystal ball on his head. Let’s draw these two things at this stage. Also, do not forget to draw the outlines of boots and extremely unusual (and mystical) bracers. We hope you did not try too hard to draw the oval of the head in the previous stages. Because in this step we will erase everything inside the contours of the crystal ball. Also in this step you should draw some horizontal folds on the fabric that is under the ball. In this step we will draw out the torso of Mysterio. 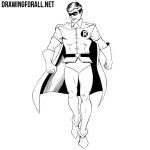 First, draw the large pectoral muscles. Under them draw the epigastric angle (the bottom of the chest and the beginning of the abdominals). And the end of this step we draw out the outlines of the mantle. We need to make it clean and beautiful, removing all unnecessary guidelines. In this step we will draw the arms in detail. So, here we need to carefully draw out the outlines of all the muscles of the arms and remove unnecessary guidelines from them. 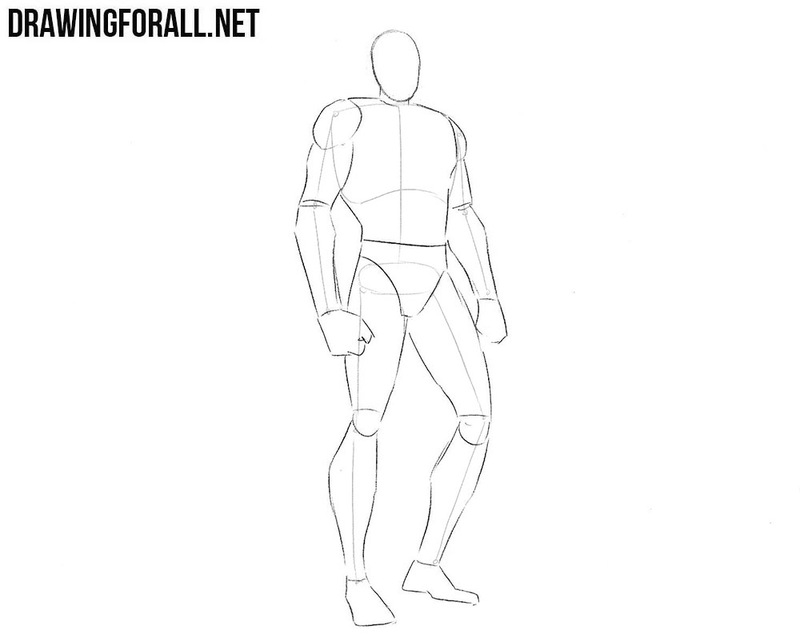 By the way, we have a special drawing tutorial about how to draw palms and fists. 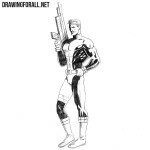 Do not forget to read this post because this is the most difficult part of the body in drawing. This step will be very uncomplicated. Here we draw the contours of the legs. When drawing legs, take into account all muscles and joints, otherwise you risk getting two pillars instead of realistic legs. After that, you should erase unnecessary lines from the previous steps. 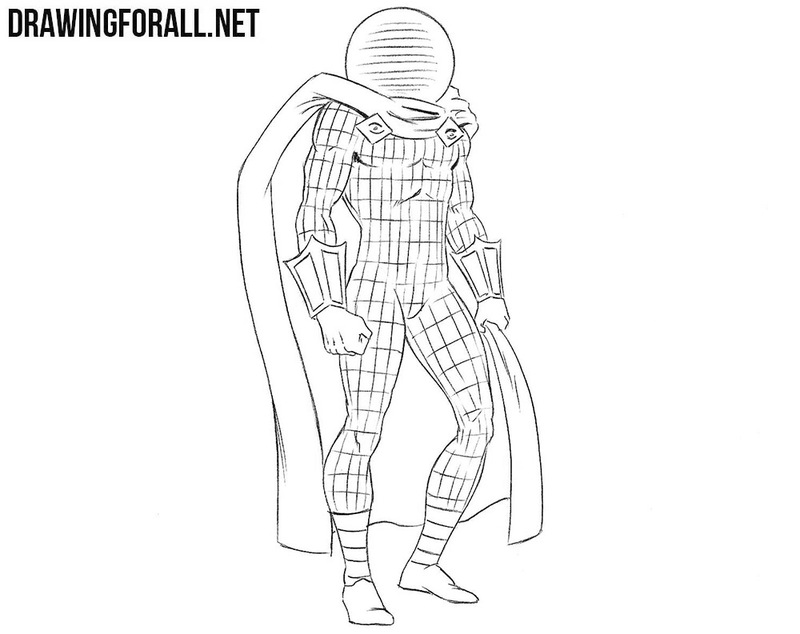 Draw a pattern in the form of cells on the costume of Mysterio. Draw these stripes taking into account all the bends and irregularities on the body, in order to give the drawing a volume. Using several horizontal strokes, mark the outlines of the head under a glass helmet. 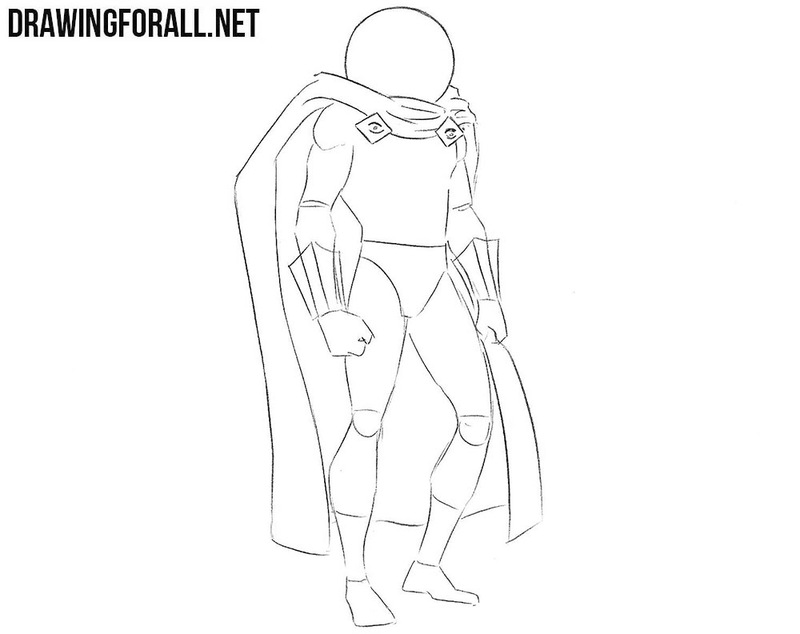 Add shadows to our Mysterio. As you can see, our current drawing is a typical example of comic style in which the shadows are contrasting and bright black. It’s best to draw the shadows in two actions – first outline the contour of the shade, and after that paint the areas of shadows. 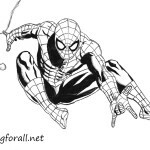 To draw halftones, use hatching. 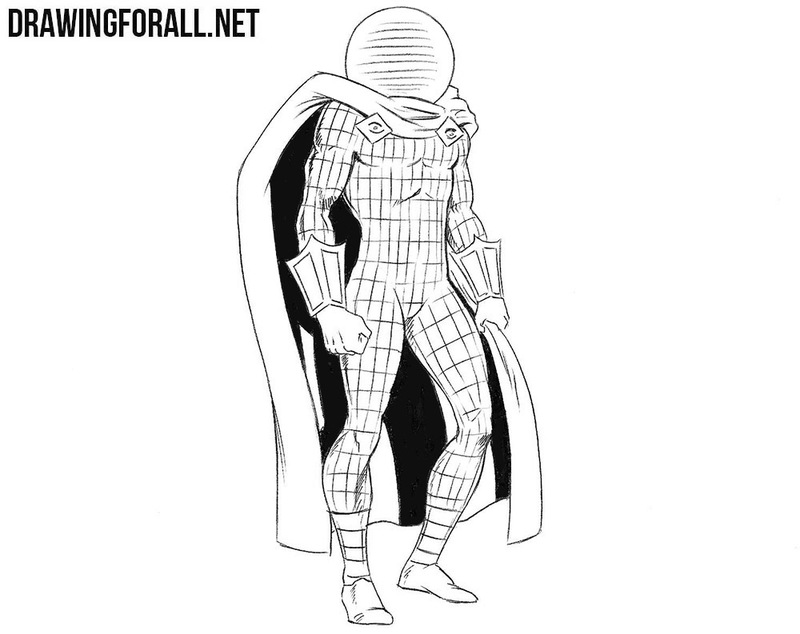 So it was a drawing lesson in which we told you about How to draw Mysterio. 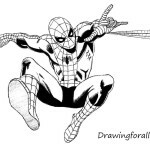 It seems we drew all the members of the Sinister Six, did not we? We have Scorpion, Vulture, Rhino and Dr. Octopus. Now we have Mysterio. It turns out that we lack only Electro, right? Follow our website and we will draw it soon. Good luck!